This past weekend I found some marinated smoked anchovies (from Martel) at the Lobster Place in Chelsea Market. I love sardines and anchovies, but this was my first experience with the smoked version. Just one word: spectacular. Lightly smoked, mild, sweet, succulent... gorgeous. The anchovies are are caught on the surface of the Cantabrian sea using ring nets which scoop from the surface only. They are placed in a delicate brine solution in barrels, hand filleted and gently smoked over beech trimmings. 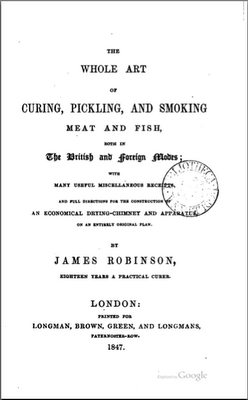 "The Whole Art of Curing, Pickling, and Smoking Meat and Fish. Both in the British and Foreign Modes with Many Useful Receipts and Full Directions for the Construction of an Economical Drying-Chimney and Aparatus on an Entirely Original Plan." This book is available here for download at Google books. "are much in request by epicures, and would be greatly esteemed by others, but they are rarely to be met with, even in the metropolis, and are, consequently, expensive ; and since no connoisseur in wine should be without them, I subjoin the information requisite to obtain them. The process is tedious; but with care and patience we shall succeed in procuring them at the most moderate rate." I cannot wait to explore this book some more - what a find.